This spectacular 55+ community offers the country club lifestyle with amenities that include an 18-hole championship golf course, heated pool, tennis courts & a 20,600 sf clubhouse with fully equipped fitness center. It is also home to some of the loveliest residences in Trinity. 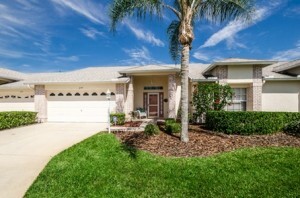 This impeccable 2 bedroom/2 bath/2 car garage home is no exception. A gracious entryway opens onto the Great Room plan providing sweeping views of the interior & the wall of sliders out to the enclosed sunroom’s views of its sun dappled yard & shade trees. The stunning bedroom suites are split by a generous great room & dining area which boast sunlit walls & beautifully tiled floors. The galley kitchen shines; featuring a pantry, stainless steel appliances, double sink, rich cabinetry, & a lovely breakfast nook surrounded by windows, dressed in wide-slated plantation shutters. A second set of sliders out to the lanai brings the overall square footage to 1835. With a door to the yard & a third set of sliders to connect to the master bedroom suite, the contemporary layout presents an endless variety of furniture arrangements. Both bedrooms are enhanced by versatile hardwood floors which can be accented with area rugs to showcase your unique design aesthetic. Entry into the gorgeously finished master bath is introduced by two walk-in closets. An enclosed laundry room is outfitted with shelving & a utility sink; with a door leading directly out to the garage, it also serves as the perfect mud room. Heritage Springs: the place to be.